Ayleen Farnood is extremely passionate about the fields of brain-computer interfaces and virtual reality. She’s built a program which allows users to spell out words by blinking, coded a chatbot while interning at Microsoft that was deployed to thousands of the company’s employees, spoken at the Connect IT conference, and put together her own personal website to showcase her articles and work. And she’s currently in grade 10. 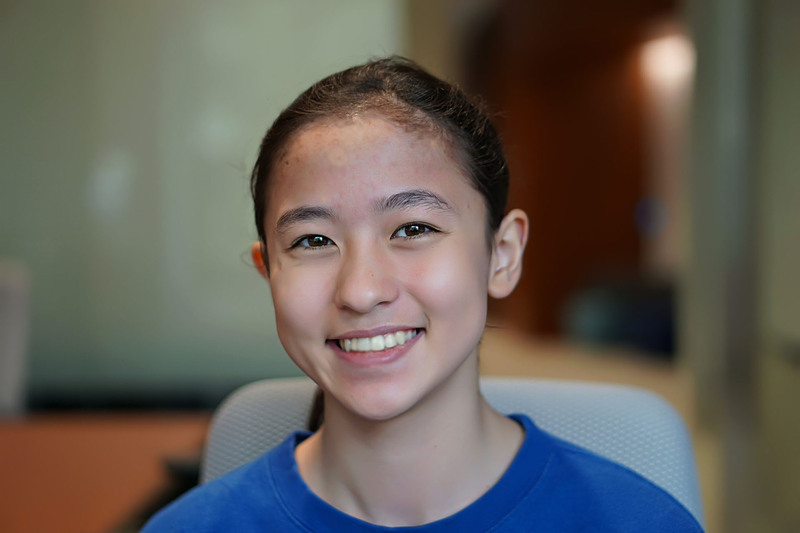 The University of Toronto Schools student has also been selected to be an Innovator with TKS — an incubator designed to prepare young people (ages 13-17) to become leaders in their industries. I first started exploring brain-computer interfaces and VR when I was… 14 years old. I became interested in these fields because… I’ve always been passionate about neuroscience and technology and actually attended a neuroscience camp the summer before I joined TKS. After I found out that BCIs actually existed and that I could build projects within the field then I got really interested and it brought me to where I am today. VR, on the other hand, has always been something which I’ve enjoyed to play with (I first tried one in a museum) and so it’s also become an area of interest for me to create these “alternate realities” which we can escape to. My proudest accomplishment is… Being able to work at Microsoft as an intern over the summer and have my projects be actually used within the company! It was such an amazing experience and I learned so much while I was there, especially since I was one of the youngest interns the company has ever had in Canada. My boldest move to date was… Hustling into conferences and hackathons, even if they’re “full” — since they’ve always been such valuable experiences for me. Some of the best and most interesting people I’ve met were at conferences and so if I ever have the opportunity to, I’ll definitely try to get involved. The next area I want to explore is… Combining the areas of BCIs and VR to create extremely immersive experiences where users can interact and perform certain actions as if they are in real life. For example, imagine thinking of walking and then having your character walk within the virtual reality game! I surprise people when I tell them… My age. Many people are always so shocked that I’ve been able to do all of these things and I’m not in Grade 12 or in university. My best advice to other grade 10 students is… Don’t let age be a factor which limits your growth. There’s so many amazing resources online which can let you learn about whatever topic you wish and tutorials for building amazing projects. If you’re passionate enough about something, then start researching it and don’t be afraid to spend a lot of time and effort pursuing your goals. The person I look up to is… Elon Musk. Despite the recent scandals, he’s been able to revolutionize so many fields in tech and create so many successful startups like SpaceX and Tesla. It’s really inspiring to see that someone can have that much of an impact on the world and I’m also really excited for one of his latest startups called Neuralink which is creating a product that will let users type words by thinking. The best advice I’ve been given is… Actually a quote which I’ve posted on the wall of my room. It says, “Success consists of going from failure to failure without loss of enthusiasm” — Winston Churchill. It’s really encouraging for me to always be able to see these words and let it keep me optimistic even when going through difficult times. My biggest setback was… While I was working on my BCI project (where users could spell out words by blinking), I had encountered a pretty bad bug which I was unable to fix for the longest time. Unfortunately, I couldn’t find any solutions online especially since BCIs are still really new and there aren’t a lot of people who are working in the field as of yet. Essentially, I got really stuck and I wasn’t sure if I would be able to successfully complete the program that I had been working on for many, many hours. I overcame it by… Contacting numerous BCI experts across Canada and in The States, asking them if they would be able to provide me with advice for my problem. Within less than a week a few of them ended up replying and they all gave me really valuable advice which helped me get past my roadblock. So not only was I able to finish up my project, but I was also able to establish some really great connections with other people in the same field who now act as some of my mentors! I stay inspired by… Continuing to hear about all of the major problems in our world today and how fortunate I am to have the opportunity to learn about new fields in tech that will literally revolutionize the way in which we live our lives. When I grow older, I really want to be able to have a positive impact on millions of people across the globe, especially by solving one of these major problems which we’re currently facing. The most exciting thing about brain-computer interfaces is… What’s in store for us in the future! If we’re able to successfully build brain-computer interfaces, we may soon be able to have brain-to-brain communication where we can literally talk with just our brain signals! The future excites me because… Technology is growing at such an exponential rate that it’s almost impossible to keep up with the new discoveries being made or products that are created. With so many experts around the world all working to improve our future, I’m really excited to see what life will be like in 10, 20, and even 30 years down the line. The career I aspire to have is… To be the CEO of my own startup! As of right now I’m unsure of what exactly the startup will be about, but it’s definitely something which I’ve always wanted to pursue and hopefully create a company that can impact millions of people. My next step is… Continuing to learn as much as I can about VR, BCIs, and other fields in tech. I’m currently programming some more virtual reality games and I’ll soon begin researching how I can combine the two technologies together to create some really cool projects!